OLD WOOD has developed an exclusive brown pigment, made with a unique process. The Walnut – Dark Brown colour has two applications. 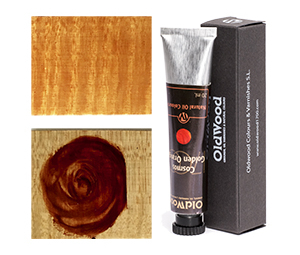 On the one hand, it gives a walnut colour with a glaze effect of incomparable luminosity and warmth. On the other, it can be used as a tint or neutralising colour agent, where its exclusivity is appreciated. Generally speaking, in order to darken a colour, we can always turn to its complementary, or use black, being careful not to use too much, because it can look cold and usually diminish the desired transparency. The aim is to maintain a harmonic colour balance, in which all the different nuances are apparent, without distortion or excessive darkening. Walnut – Dark Brown is the neutral shade that OLD WOOD has developed to correct the red or any other colour that has been used to excess, while maintaining transparency, enhancing the hue and correcting the excess without dirtying it and, what is most important, enriching the nuances.